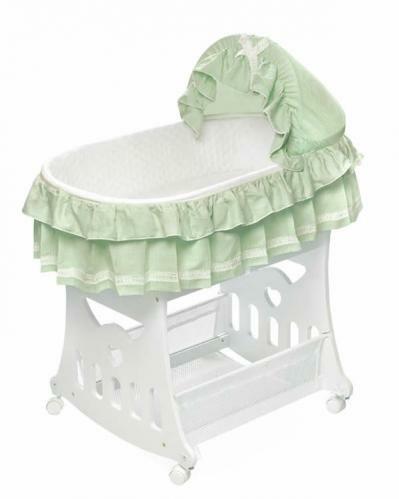 Full Description Our popular 2-in-1 Convertible Bassinet continues to sell year after year. We've refreshed the bedding with this new fashionable style! When baby outgrows this beautiful bassinet, convert the base to a handy toy box! When used as a bassinet, the base features a handy mesh basket for storing sleeping and changing supplies. Portable bassinet can be lifted off the base and used as a bed for baby anywhere else in the house or when visiting friends (not for use in the car). Bassinet converts to a "rocking cradle" by flipping up the caster wheels. Complete bedding set includes: soft quilted liner, pretty two-tier skirt attached to the liner, matching hood cover, white sheet, and vinyl covered foam pad. Dressed in our sensational Sage Waffle fabric.Basic assembly of the stand is easily completed within minutes with a screwdriver. Illustrated instructions included. Bedding is a machine washable cotton and poly/cotton blend. For use from birth until approximately 15 lbs (6.82 kg) or until baby can push-up/roll over unassisted.